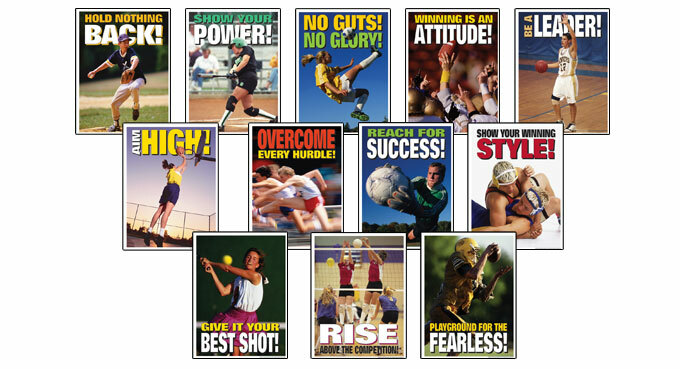 The High School Inspirational Sports Posters are designed to encourage students at the high school level to participate in sports. The posters use inspirational images quote to send positive encouraging messages to teenagers. These posters are a great addition to any high school campus. The Winning is an Attitude Poster is intended to remind teenagers that in order to win they must try their best. The poster uses an inspirational image of a football team and the words “winning is an attitude” to demonstrate how your attitude can affect your success. This poster is a great addition to any high school classroom. The Try Your Best Poster is intended to encourage teenagers to push themselves to achieve their goals. The poster uses an inspirational image of a girl swinging a tennis racket and the words “give it your best shot” to demonstrate the importance of trying your best. This poster is a great addition to any high school classroom. The Success Poster is intended to remind teenages the importance of working towards a goal to accomplish it. The poster uses an inspirational image and text to portray its message of hard work and dedication. This poster is a great addition to any high school classroom. The Show Your Winning Style Poster is intended to remind teenagers that everyone achieves goals at different paces. The poster uses an inspirational image and quote to demonstrate the importance of being an individual. This poster is a great addition to any high school classroom. The Show Your Power Poster is intended to demonstrate the importance of showing your strengthens. The poster uses an inspirational image and the quote “show your power!” to portray its message. This poster is a great addition to any high school classroom. The Seize the Moment Poster is intended to remind teenages to take a moment to themselves. This poster uses an inspirational image and quote to portray the importance of enjoying your accomplishments. This poster is a great addition to any high school classroom. The Overcome Challenges Poster is intended to remind students not to give up on their goals. The poster uses an inspirational image and quote to demonstrate that it is not always easy to achieve your goals. This poster is a great addition to any high school classroom. The No Guts No Glory Poster is designed to remind teenagers that achieving their goals is not easy. The poster uses an inspiring image of a girl kicking a soccer ball and the words “no gut no glory” to encourage teenagers to work hard to achieve their goals. This poster is a great addition to any high school classroom. The Hold Nothing Back Poster is intended to remind children to always give their all towards whatever activity they are participating in. The poster provides an inspirational image and quote to portray this message. This poster is a great addition to any junior high school physical education classroom. The Give it Your Best Poster is designed to inspire teenagers to be the best they can be. The poster uses an inspirational image and the words “ go all out” to portray its message. This poster is a great addition to any high school classroom. The Fearless Poster is designed to remind high school student to not be afraid of accomplishing their goals. The poster uses the inspirational quote “Playground for the fearless” to portray its message. This poster is a great addition to any high school classroom. The Complete High School Inspirational Poster Series is designed to inspire high school students to strive to be the best they can be and achieve their goals. These posters use inspirational images and quotes to portray their messages. This poster series is a great addition to any high school campus.